With Shoes: Pleasure and Pain now in full swing, I thought it was about time to raise a drink to the shoemakers of 17th and 18th century Europe! Across Europe, drinking alcohol was deemed essential for the good health and harmony of society at all levels. 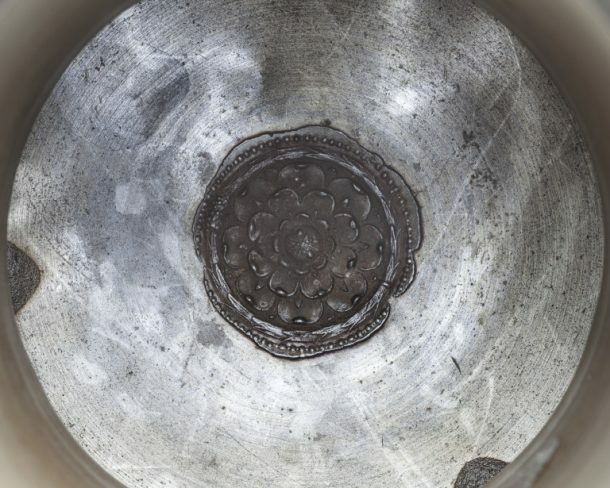 Rituals, such as toasting and drinking games, were performed using vessels made with a variety of materials and decorative techniques. Drinking rituals encouraged and declared fellowship among men, love between married couples, the loyalty of subjects to their rulers, or in this case allegiance to a guild. 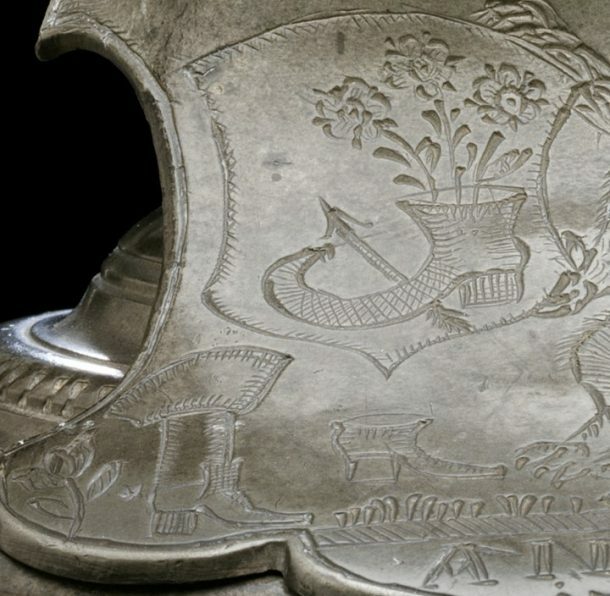 Some of the most magnificent pieces in the Museum’s pewter collections are the former treasures of German craft guilds, most notably their drinking vessels. This particular tankard was made by Joseph Dor in 1704 and belonged to a German shoemakers’ guild. 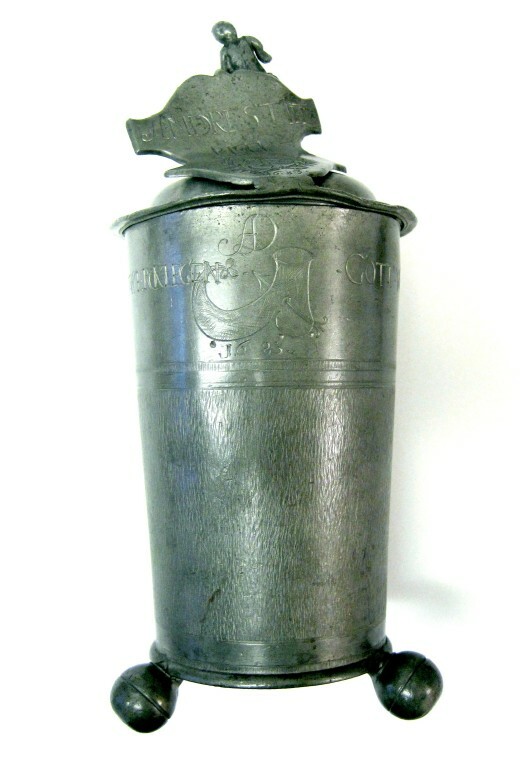 It will be displayed in the Europe Galleries as part of the Drinking display. Standing on three small round feet, at 50.5 cm tall and weighing 8.16 kgs it is quite a substantial piece. Large vessels like this would have been used for formal dinners and other official guild occasions. 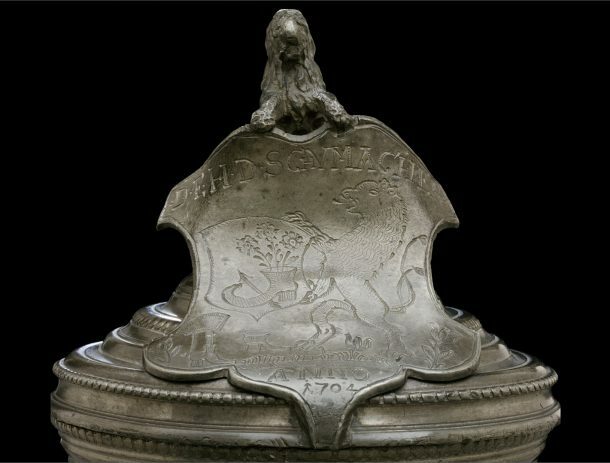 On the lid a lion holds up an armorial shield of the guild, which depicts another lion holding a shield decorated with a ‘blooming’, curled shoe. By the lion’s feet lie another two rather fetching examples of footwear. 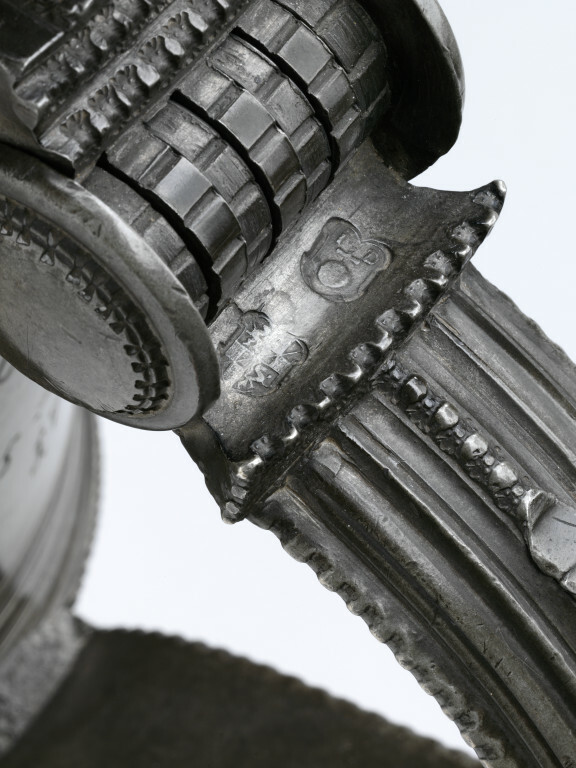 One characteristic of ‘guild pewter’ is the abundance of names and dates engraved over them. 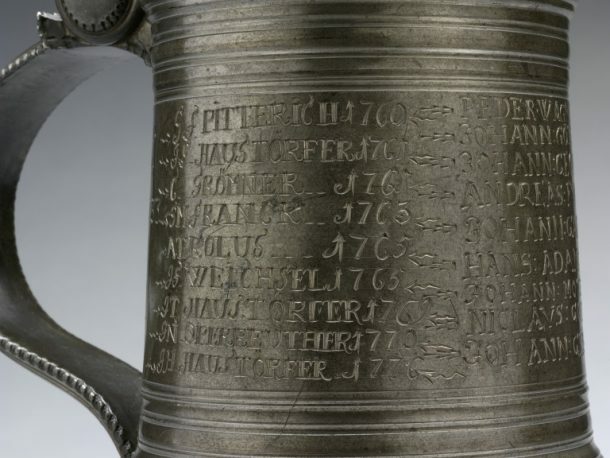 Here the names of officers belonging to this particular guild, from 1709 to 1776, are inscribed around the body of the tankard. Hidden inside is an additional decoration of a rosette set into the base. 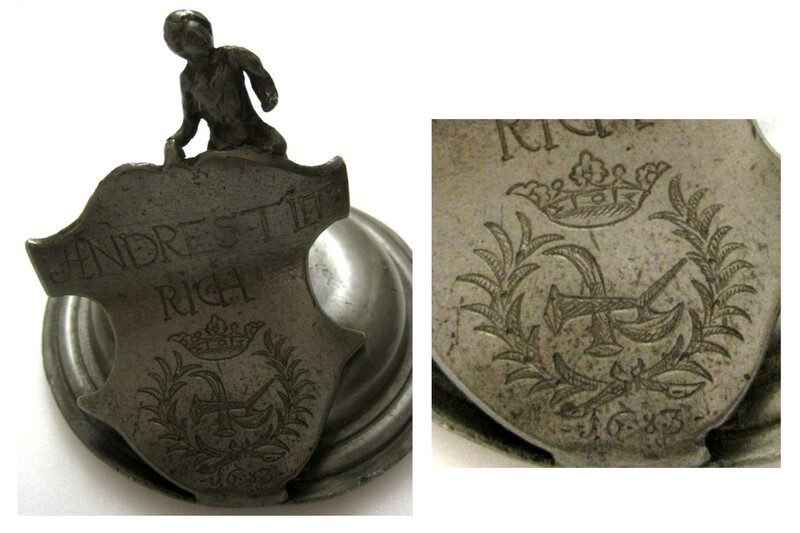 The rosette decoration hidden inside on the base. Another example of a German shoemakers’ guild vessel, with a rather fun depiction of a shoe, can be found in the Museum’s collections. 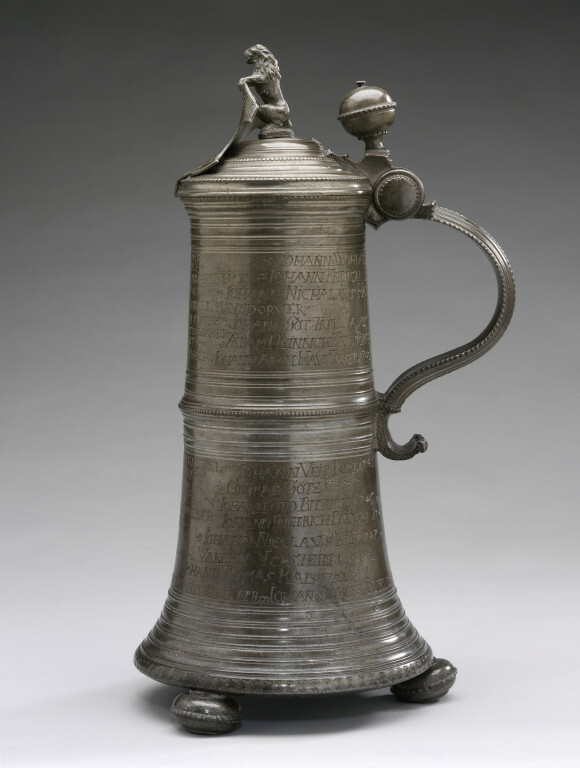 At 24.7cm, this lidded cup is around half the size of the tankard going into the Europe Galleries. Interestingly, whilst decorated with a shoe on its body, this particular guild’s armorial shield does not feature shoes, but instead what appear to be shoe-making tools(?) with a crown. Also, the surface where you would expect to the engraved names of guild members is instead filled in with plain etching. 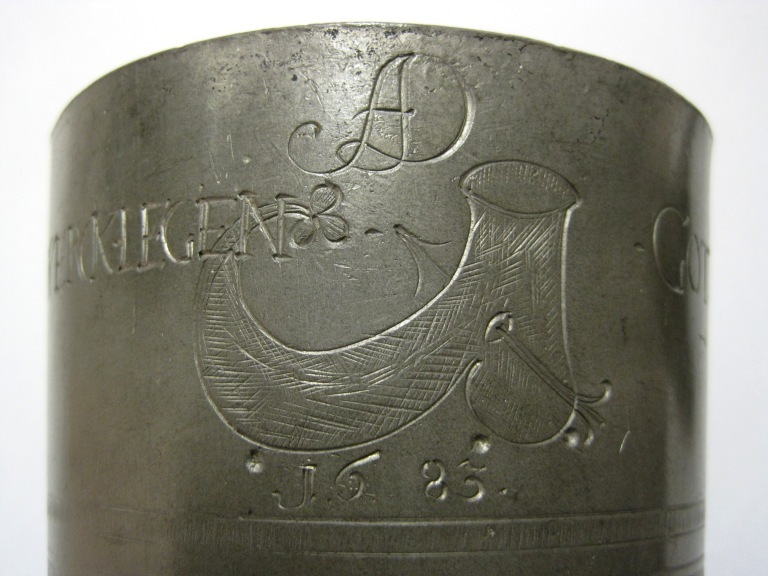 In addition to formal covered cups, or large tankard, guilds would also commission vessels in a shape relating to their craft. German guild drinking vessels often show significant ingenuity in their design. 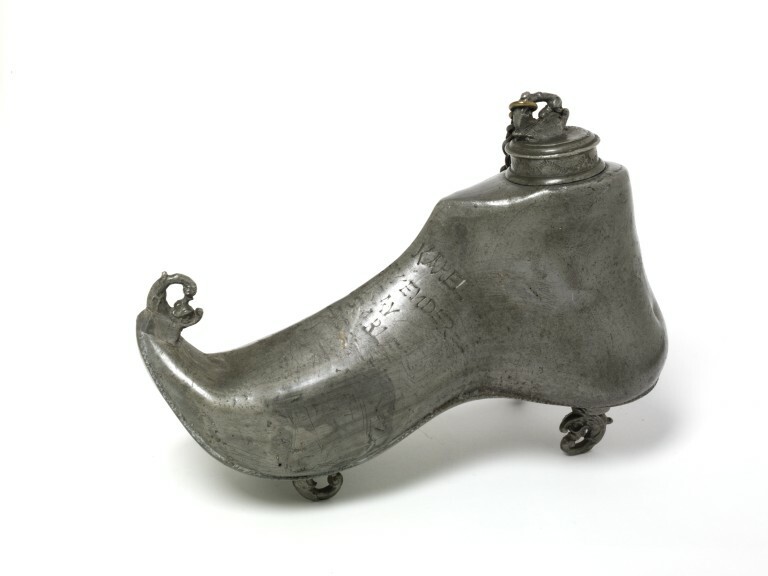 Most shoe-shaped flasks or cups are (as you might now expect) associated with shoemakers’ guilds. A nice example in the collections is this cast pewter, shoe-shaped flask, which was made in Nuremberg in about 1550. This can be seen on display in our Brass and Pewter Galleries (room 116). While larger vessels, like the one above, would have been used in a more static manner, such as to decorate multi-tiered buffets, smaller ones like this would have been used for ceremonies. Often, starting with the Master of the Guild, the cups or flasks would be passed around members of the guild, with everyone taking a sip and proposing a toast. All of this has made me rather thirsty. As it’s the end of the day, I might just head off for a drink – as a mark of respect to the shoemakers of course!